Rick’s choice of a Venezuelan place in Chelsea quickly raised some eyebrows amongst our group when we were notified. A few months earlier, we traipsed to Inwood for Venezuelan cachapas on Dyckman Street Stalking Corn on Dyckman Street. It wasn’t only the relatively quick repeat of a cuisine that was odd, it was also the location. Chelsea, in its present incarnation, is not a neighborhood where we would think to find our kind of restaurant; meaning one suited more for our penny pinching tastes. The false alarm was a reference to the impending birth of his first child; the due date set for early December. We all wished the best for Rick, but his pronouncement was just too sudden and late in the day to stop us from heading to Chelsea. Before anyone else had arrived at El Cocotero, Zio had scouted it out. “It’s so dark in there, you won’t be able to find your mouth with your fork,” he wrote in a text. 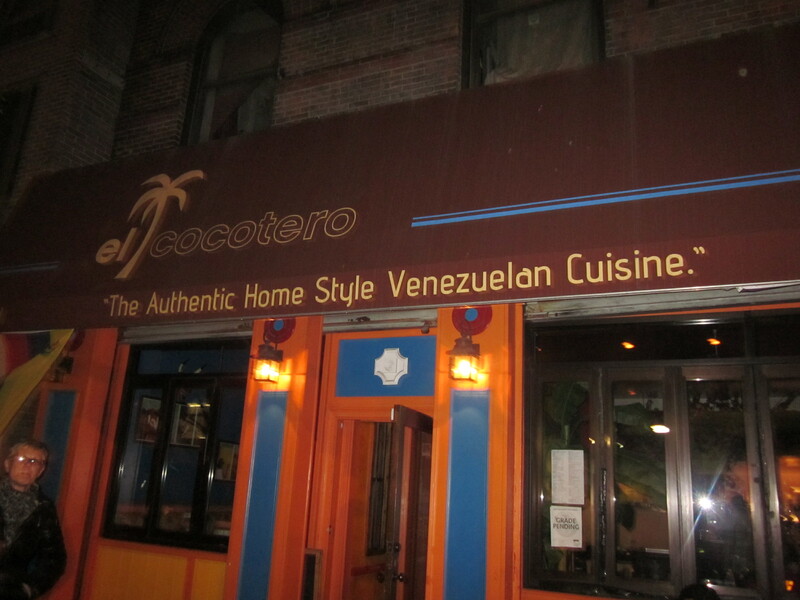 You couldn’t tell that power had been restored weeks ago in Chelsea judging by the lack of light in El Cocotero. When I entered, I immediately thought Zio was exaggerating. 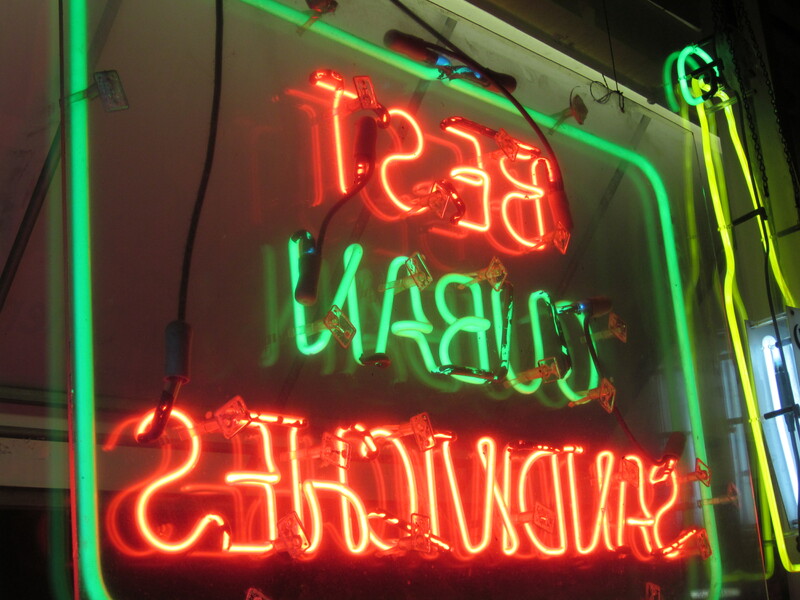 It was dim, for sure, but the flickering candlelight wouldn’t stop me from stuffing my face. Reading the menu, however, was a more challenging issue. Without my reading glasses, the menu print seemed as insurmountable as trying to read a Russian novel without a magnifying glass. Thankfully, Eugene’s eyes were stronger than mine and he informed all of us that the cachapas were ten dollars—almost $4 more than what we paid at Cachapas y Mas on Dyckman Street. To make matters worse, the table we were given was so cramped that there was the very frightening prospect of rubbing thighs with Mike from Yonkers while trying to get the food from fork to mouth. “This is a date place,” Eugene blurted out. Indeed it was, and Mike from Yonkers was not my date. Since Rick was not going to be joining us, there was no reason to endure eating at a romantic restaurant with the likes of Eugene, Gerry, Mike from Yonkers and Zio—and I’m sure the feeling was mutual. Our group slunk out of El Cocotero, lamely apologizing to the manager as we exited. The prospects of finding something Chow City like in Chelsea, we knew, were not good, but we had to try. I knew of a nearby Szechuan place that I liked, though it was probably as expensive as the Venezuelan we just left. 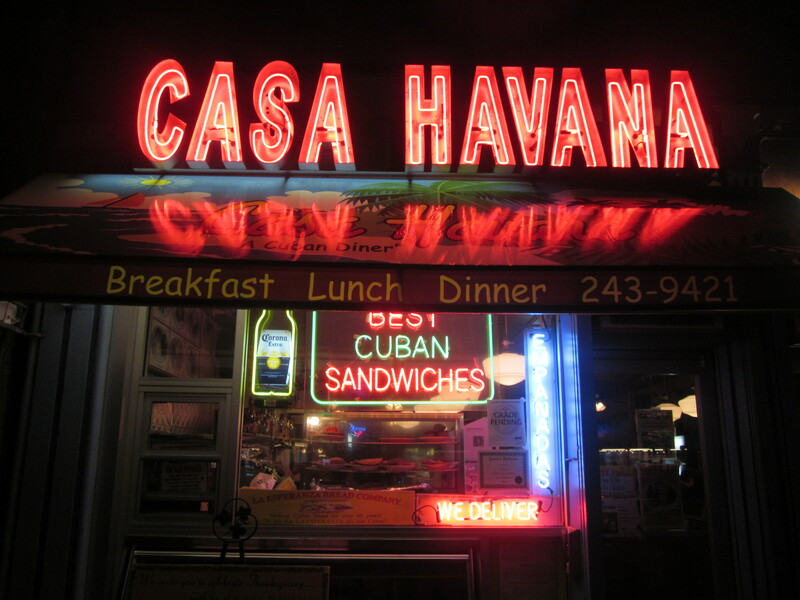 And then I remembered passing a Cuban diner on 8th Avenue on my way to El Cocotero that looked like something closer to our criteria. I mentioned it and our ensemble headed in that direction. 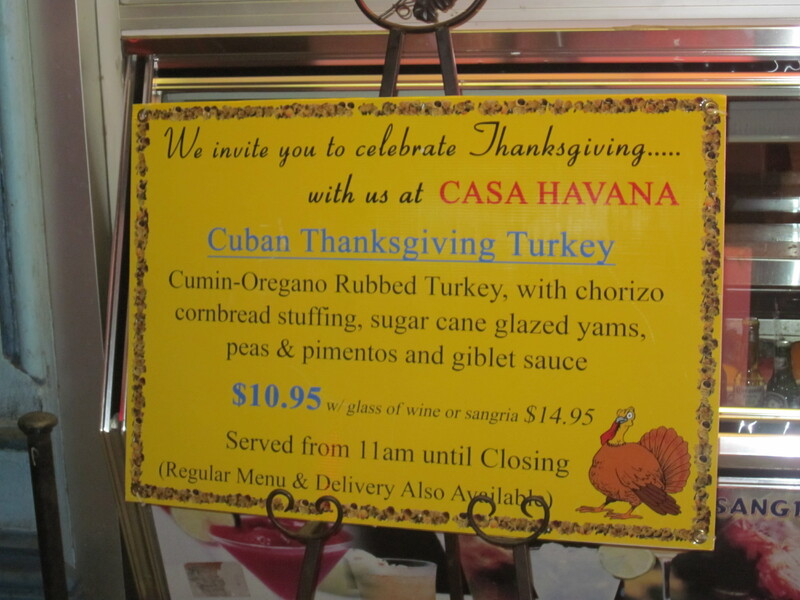 In front of Casa Havana was a placard advertising Thanksgiving dinner for $10.95 and another displaying a glistening suckling pig for $12.95. Eugene didn’t have to see anymore to be convinced. He was halfway to a table when Gerry, still out on the street, whined that he had eaten Cuban food the previous day. We looked at him. You could never tell whether Gerry was joking or serious. “Really, I did—in Montclair,” he said. We all hesitated. Eugene came back out of the restaurant. “What now?” he barked. This was becoming a fiasco and Gerry knew it. “All right, let’s just go here,” he gamely conceded. While our Mexican waitress brought the Cuban menus to our ample table, Dominican meringue played over the restaurant’s loudspeakers. Glancing at it, I noticed that the prices were lower than what we would have experienced at the Venezuelan place around the corner, but more than we would have paid for similar food uptown. There was nothing out of the ordinary on the menu; rice and beans, fried pork, fried fish, roast pork, shrimp in garlic sauce, beef stew, etc. “Do you have the turkey?” Eugene asked our waitress, referring to what was advertised outside the restaurant. She shook her head. “No, we just have that for that other day,” she said, meaning Thanksgiving. Instead, he settled on shrimp criolla while Zio, keeping to his fishy pattern whenever we gather, ordered the “lubina frita,” fried bass. After his Cuban meal in Montclair, Gerry eschewed the entrees and instead chose a Cuban sandwich with a small bowl of black bean soup. Mike from Yonkers was rebuffed by his first choice of fried snapper and had to go to plan B: the baked chicken. 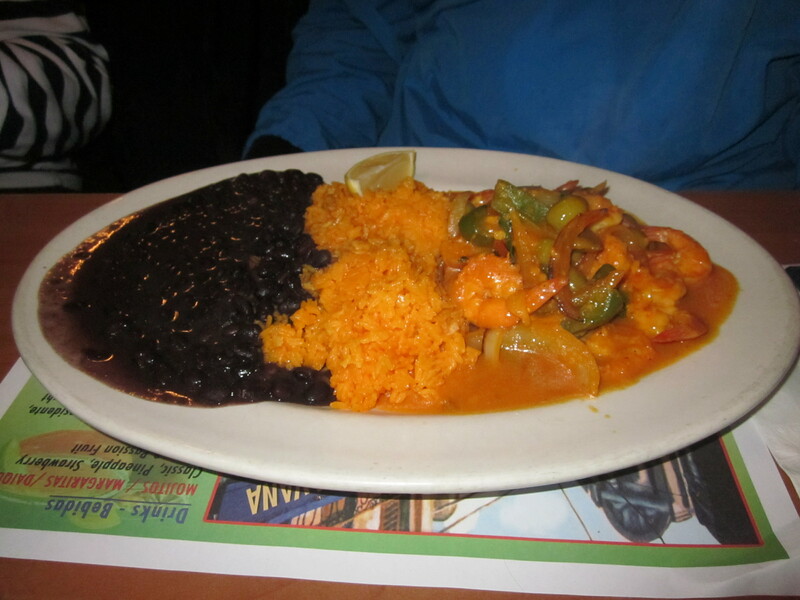 I decided on the “chuletas,” (pork chops) in red sauce with yellow rice and black beans. While we waited for the platters to decorate our table, all of us except Zio, who sipped a mango “batido,” had $5 Mexican beers. 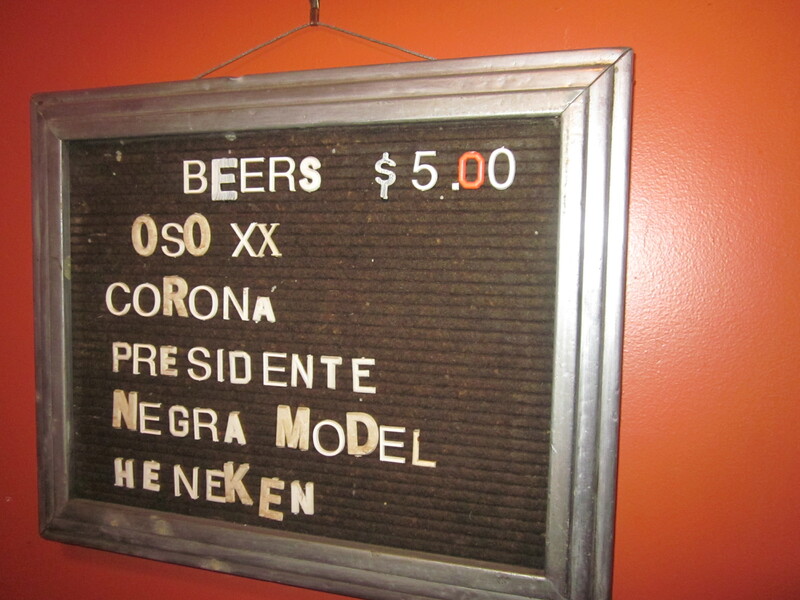 Embargo beer options at a Cuban Restaurant. The food came and we plowed through it without many exclamations. No one complained. No one praised. The chuletas were skimpily thin and swimming in a non-descript tomato sauce that benefited greatly by a large dousing of the house hot sauce. Because the food did not inspire discussion, we had no choice but to listen to Eugene describe the annual Christmas party he attends—the one with the Viennese dessert buffet—as well as the many meals he eats at the all-inclusive resort he frequents in the Dominican Republic. 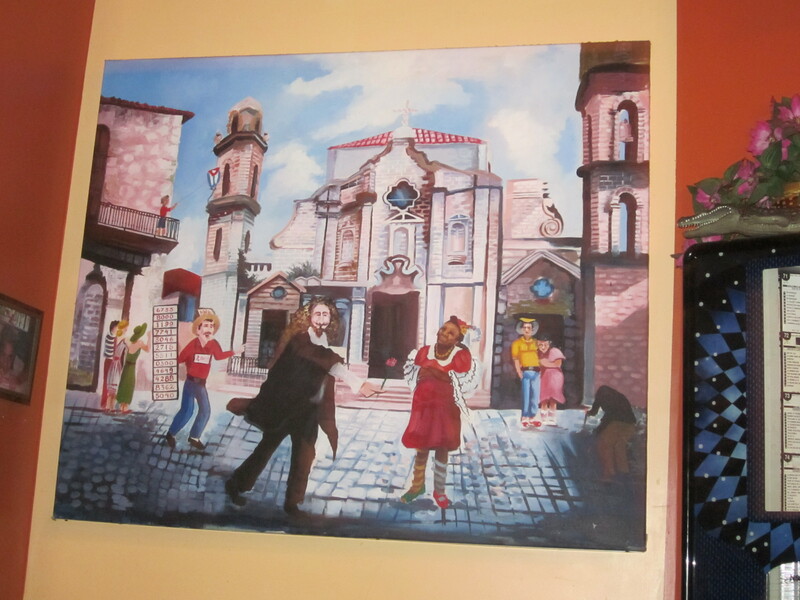 Who knew Shakespeare vacationed in old Havana? Gluttons for punishment, to name just one of the things we are gluttons for, we could have just called it a night in Chelsea. Instead, hoping we would find something to praise, we all had dessert. Sadly, even the desserts; coconut pudding, coconut cake, tres leches cake, and chocolate cake, did not surpass uptown standards. And, as he suspected it would be, Rick informed all of us that indeed the trip to the hospital was a false alarm. If only we could have said the same thing about our trip to Chelsea.